Monday through Friday, between 8:00 to 9:00 PM, you can often find me wandering aimlessly through my neighborhood mall. By car, I can get from my door to Lloyd Center in 3 minutes, and I know the route well, because that’s where I go to decompress after my kids are in bed. This photo to the left is what I look like during the short drive to the mall. I’m like a wound-up addict, desperate for her next fix. Lloyd Center has a reputation in Portland as being a crap mall, but it’s my home mall, so don’t talk sh*t about it to me. I could probably get through it blind-folded, which would be great because the blindfold would prevent me from having to look upon the horrific carpeting. As malls go, it’s relatively benign; judging from the Hot Topic, GameStop, and Alley Kat, the mall’s target demographic appears to be the disenfranchised tweener. It’s hard to really do that much harm in it as an adult, which makes it perfect for my purposes. In any event, I don’t really go there to shop. At the end of a frenetic weekday, I want to go someplace where I can zone out and think about absolutely nothing. It can’t be too quiet, or I’ll start thinking about my kids, or God forbid, work. And it’s best if, while I’m zoning out, I’m looking at something entertaining, like the underwear at Frederick’s of Hollywood, or a flat-iron demonstration performed by a man. So Lloyd Center it is. At Lloyd Center, there are simple joys to be had. I usually start at Nordstrom, which is blissfully empty at 8:00 PM. I like the sunglasses department best. It’s a quiet little spot if you don’t mind trying on sunglasses with huge security devices attached to them. There’s usually only one employee staffing both Sunglasses and the department next door, so you won’t be harrassed by the distracted salesperson, who is focused on making sure that no one’s stealing any Spanx back in Hosiery. I’ve spent so much time in Sunglasses that I feel bad that I’ve returned every pair I’ve ever bought there. They can’t trace all those refunds back to me, though, because I have Tom, who will return stuff for me if I cry hard enough. Refunds are awesome because anyone knows that when you return something, you’re actually making money. After Nordstrom, I make a beeline for the center of the mall, which is where you will find the Trifecta, otherwise known as the only shoppable stores in the mall, otherwise known as 1) Forever 21; 2) the Gap; and 3) Cinnabon. I’ve enjoyed a lot of contented moments watching the figure skaters twirling around in the rink below while tearing into a pecan Minibon. The Minibon is my concession to health, because what my heart truly wants is a Wetzel Dog. I am many things, but a person capable of ignoring a hot dog wrapped in buttery pretzel dough is not one of them. 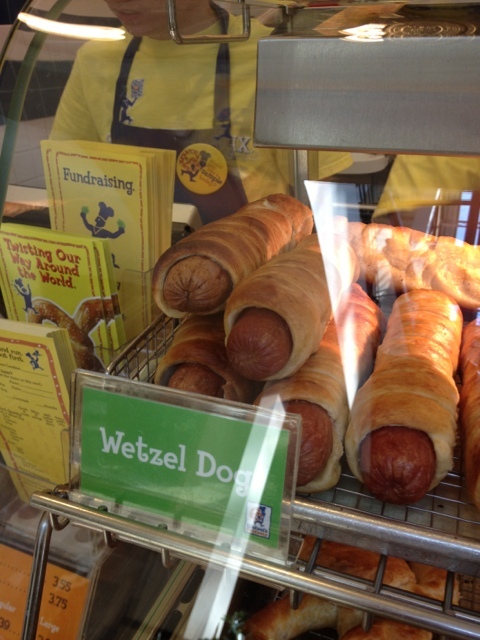 Sometimes I want a Wetzel Dog so badly that I have to walk past Wetzel’s Pretzels sideways, with my back to the display case where the Wetzel Dogs are kept. And sometimes even that doesn’t work, because I can still smell them. But if you approach the Trifecta from Nordstrom, you pass Cinnabon before you pass Wetzel’s Pretzels, so it generally works out. Because even I can’t eat a Wetzel Dog after a Minibon. 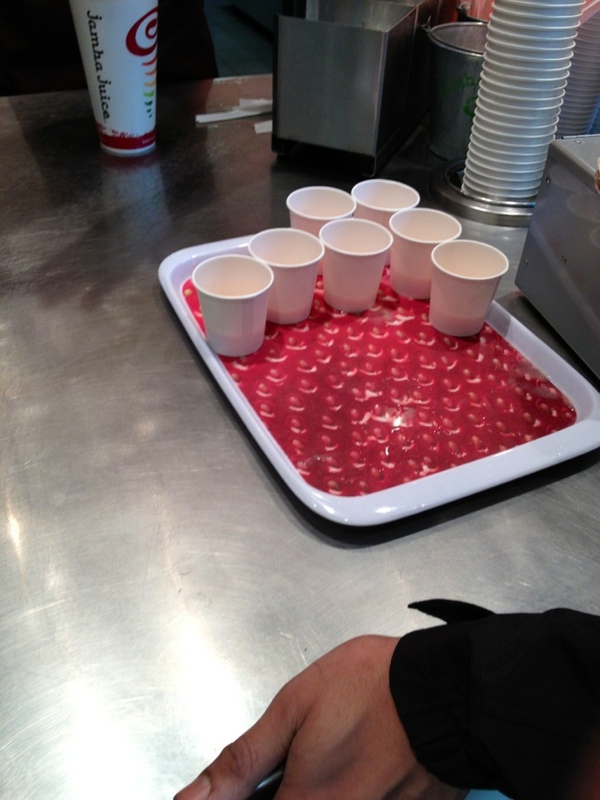 After my Minibon, sometimes I get a little parched, so I’ll walk a few stores down to Jamba Juice, which is always giving away samples at this hour. They are very chipper folks at Jamba Juice, and I hope to return their kindness one day by actually paying for a drink. I linger over my three Jamba Juice samples while perusing the offerings at Kay Jewelers, which calls itself a jeweler but should really be called “The Locket Store,” because so far as I can tell, it only offers 2000 iterations of the heart-shaped locket. Or I might enjoy my Jamba Juice samples while being massaged by a chair at Brookstone. If I have extra time, I’ll head downstairs to Ellaris, which is a kiosk that sells cellphone covers. There are lots of fun choices, but only two will fit your phone–one is a subtle pink camo and the other inevitably has Hello Kitty on it. Take your pick. It’s one for $15, but you can get both for $20. After popping in at F21 and the Gap, it’s time for dessert at See’s Candies, where I will put $1.05 on the debit card for a Maple Buttercream, and get two chocolates for free as samples. I don’t understand their business model, but I’m also not one to look a gift horse in the mouth. The free ones usually have nuts in them, but I’ll choke them down while browsing the tweezers at my next and last stop, Trade Secret. And that fills the hour, and brings me back to Nordstrom. If I’m back at Nordstrom by 8:55, I’m golden. That gives me time to buy Tom a latte at the Nordstrom espresso stand, which the barista starts shutting down at 8:45. It’s always hard to tell who is more annoyed by my order, the barista or me. Here’s my view: I’m sorry you already put the milk away, but maybe you should wait to close down until it’s actually, you know, closing time. 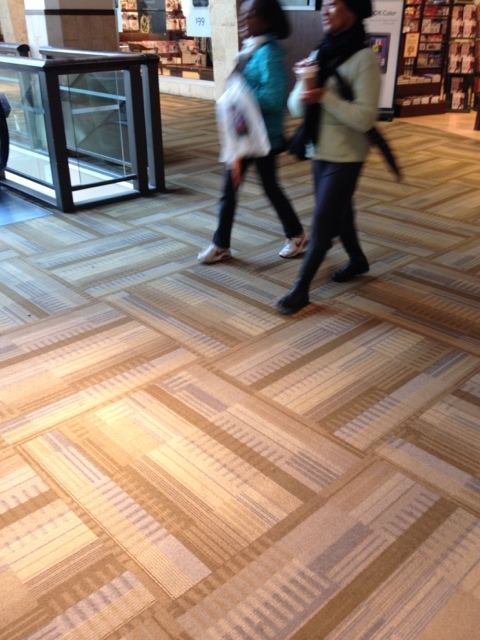 That’s my only complaint about Lloyd Center, besides the carpet, and the elevators that smell like cheese. Otherwise, LCTID. Ahh the Lloyd Center. I used to frequent there when I lived on that side of town, but now I’m 10 minutes away from Washington Square. I generally dislike malls in general. Lloyd isn’t so bad…even for it’s reputation, which I find odd. I’m originally from the East Coast and we have tons of huge crappy malls there with wannabe thugs…so Lloyd is “nice” compared to that. I personally can’t stand Washington Square for all of the suburbanites that go there. I do love your photo of yourself at the top though 🙂 The glasses rock! guess where i got them. I’m inclined to say Lloyd since you frequent there, but I have this uncanny feeling it’s Washington Square?? Personally I don’t think anyone should disparage a mall boasting a Nordstrom. Although that carpet makes me doubt my own statement. As an NEP native I get weirdly protective of Lloyd Center when it comes under attack from “outsiders.” I think I equate it with the once-prevailing view in this town that Northeast Portland (including the neighborhood I grew up in, which as you well know is hardly the mean streets) was unsafe or at the very least undesirable. That perspective always irritated me when I was younger. It continues to annoy me today as the close-in east side neighborhoods become more and more attractive to downtown professionals and the rest of the Portlandia set who like the idea of “urban” living, but aren’t quite ready to get their hands dirty shopping at Lloyd Center. you feel about lloyd center the way i feel about the benihana in beaverton. like, you can make fun of it a little, but not a lot, because i grew up there (not at the benihana specifically). that said, i am having trouble imagining you at lloyd center. what do you buy there?? We’re clearly on the same page. I feel like my history at Lloyd Center entitles me to make reasoned criticisms of the place that are beyond the grasp of newbies. I’m old enough (barely) to remember its original status as an outdoor mall, and my first-ever job was as a 15-year-old holiday part-timer at the Lloyd Center Nordstrom. I think the better question would be, what don’t I buy at Lloyd Center. The LC Nordstrom remains my go-to spot for dress clothes and moderately stylish casual wear, except to the extent I need shorts or flip-flops, which I purchase at Zumiez. Most of my tennis shoes (including the sweet pair of blue Adidas Campuses I picked up over the weekend) come from Foot Locker or Foot Action. I’ve long maintained that Marshall’s is the ideal store to buy gifts for adults whose tastes I don’t know particularly well. The home and kitchen stuff is shockingly decent and well priced, as it’s basically the Nordstrom Rack for Macy’s and the rest of the May Company stores. And if I can’t find wrapping paper or boxes there, I just backtrack to the Hallmark store across from the aforementioned (in your post) Nordstrom espresso bar. And did I mention that I bought my oh-so-trendy Rayban Wayfarer sunglasses at the Lenscrafters on the second floor not far from Sears (from whence I purchased the undershirt I’m wearing as I type this)? I dare any man or woman to challenge my Lloyd Center bona fides. Also, how have you and I not discussed this before? Soon you can add H&M to the list, no? LCTID, indeed. yes, and i’m pleased as punch, although that will certainly throw my route off. the H&M’s proximity to nordstrom makes things very efficient, however. This is my favorite post of all time. I want you to write your next book all about adventures at the mall so I can snort laugh all the way through it. Love. it’s the nice malls that freak me out. i went to a mall once in costa mesa where i was too intimidated to enter any of the stores. what a waste! luckily they had a nordstrom, and a nordstrom cafe.